Striking workers greeted art incubator trainees as the week-long trade fair got underway. 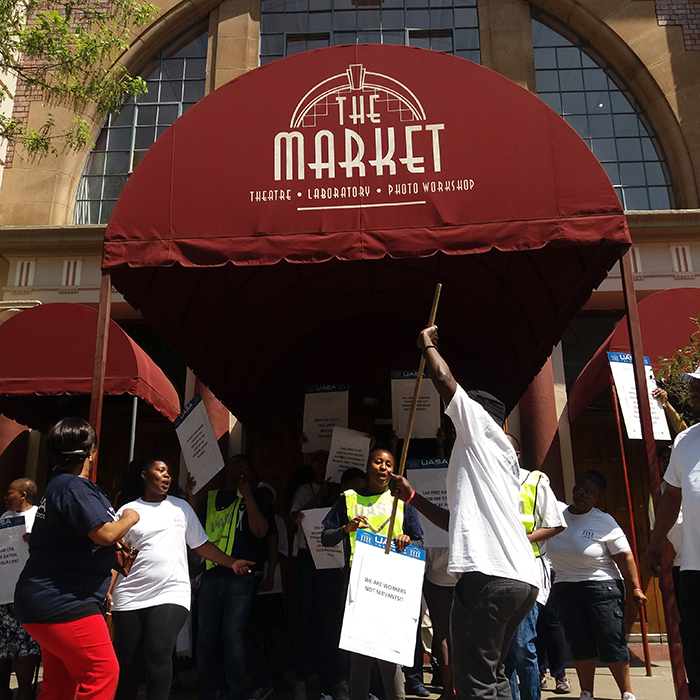 A score or so of Market Theatre workers were toyi-toying beneath the theatre’s iconic awning on Monday last week. It was a hot Joburg day and they couldn’t be blamed for seeking some shade while protesting for a wage increase. It also had the effect of preventing anyone from entering the theatre where so much protest has taken place on the stage. But the actual administration happens just across the road, in the new Market Square building, so the Arts Incubator’s Trade Fair programme, which had just got underway, was delayed rather than derailed. There weren’t many complaints about workshops starting a half-hour or so late, but mutiny threatened when the caterers didn’t arrive with lunch. Trainee graduates from the six publicly funded arts institutions who had gathered for a week of showcasing their work, learning from lectures, visiting important arts venues, and meeting their peers from other provinces, threatened to join the UASA members and show them what violently expressing a grievance looks like. The placatory food arrived just in time. About the same time a 5% wage increase and 13th cheque deal was struck between the union and management. The rest of the week flowed relatively smoothly, and all eight performances developed through the PAI (Performing Arts Institutions) incubator programmes were staged on time and on the days scheduled. What was on stage was a contorted reflection of Monday morning’s scene, which was in itself a tame microcosm of South African daily life. And our theatre has a long history of distilling our issues and presenting them as stories. Only this year, unlike the inaugural Trade Fair, the programme was dominated by dance and musicals. Four of the works were dance, two musicals, and just two were drama. And one of those was an ensemble work. This was the year of the choreographer killed the directing star. And like last year, the standard was high, with only one work disappointing (read the reviews and it’s clear). Three of the works were exceptional, and two of those had choreographer Lulu Mlangeni’s hand in them. In fact one – Confined – featured her, which could be considered cheating, but you’d have to take that up with Market Theatre artistic director James Ngcobo, who travelled to all the PAIs and selected which works should be showcased. But beyond the performances, the incubator trainees got to hear how the PAIs in the other provinces are operating, and hang out together, which is how collaborations are born. And collaboration is a Good Thing. It is how art is created. Yet, contrary to what the writers of best selling self-help entrepreneurship books say, it cannot be forced. It is as elusive and constant as friendship and the joyful exchange of ideas and all that can be done is create conditions in which it might occur. Such as hanging out with peers from different provinces for a week. Although the Department of Arts and Culture (DAC) put R1.2m into funding the week-long get-together of PAI incubator trainees, neither the minister nor the director-general made an appearance at the closing ceremony on Saturday. They must have had better things to do. Anyway, the DG did provide a speech which was delivered by Thembi Malau. It wasn’t particularly inspirational but it did at least state that the incubator programme, which has trained 2000 young people who have created 30 shows since inception, is valued for its contribution to the development of critical skills. Whether the government really appreciates just how critical the artist’s skills are is less certain but the least we can hope for is that the DAC continues to fund the incubator programme and allow the PAIs to get on with doing what they do best. Removing political interference from their boards would be a good start. Unfortunately, and despite criticising the DAC for not having its head honchos present, The Critter was also not able to be at the closing and awards ceremony due to an ill-timed flight out of rambunctious Jozi. Thus no first-hand comment on the celebratory atmosphere can be made. Hearsay is it was, however, celebratory, with massive support and shout-outs all round as the awards were read out. The second annual Arts Incubator’s Trade Fair was hosted by the Windybrow Arts Centre and took place in the Market Theatre precinct from 16 to 22 September.